We supply a wide range of Holding and Retrieving Magnets, including Standards Holding and Retrieving Magnets, Underwater Retrieving Magnets, Super Holding and Retrieving Magnets and Common Holding and Retrieving Magnets to worldwide customers. 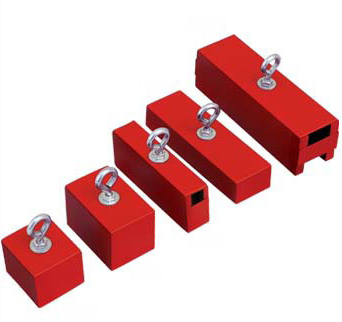 You can customized your own size Holding and Retrieving Magnets, too. 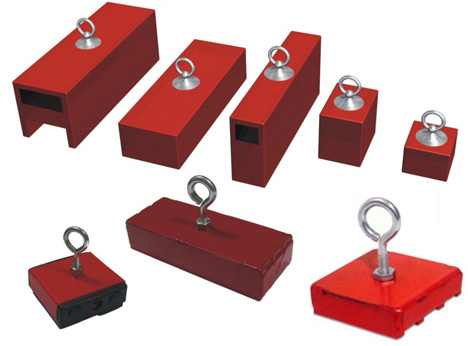 Holding & Retrieving Magnet These are used for holding and positioning purposes like spray nozzle, hoses, pipes, temporary wiring.This also helps in retrieving ms objects from deep pits,water ways.These magnets come with eye bolts for fixing ropes. Retrieving Magnets are designed for heavy-duty and underwater use, these high-power retrieving magnets will recover lost equipment, keys, tools, fishing tackle or any ferrous metal objects that may fall into deep water, wells or holes. To remove captured objects, simply twist and pull object from magnet. Standard and Common Holding and Retrieving Magnets can be plated with both Red painting and Black painting. A hole is built-in the magnets to attach the eyebolt for different application. Eyebolt and nut are included in each magnet. Holding and Retrieving magnets offer hundreds of commercial and industrial uses, including retrieving hand tools and other metal items from waterways, retrieving an outboard motor from the bottom of a lake, and sporting, household, industrial and commercial uses. Eyebolt and nuts included. They have high water resistance and heat resistance performance. 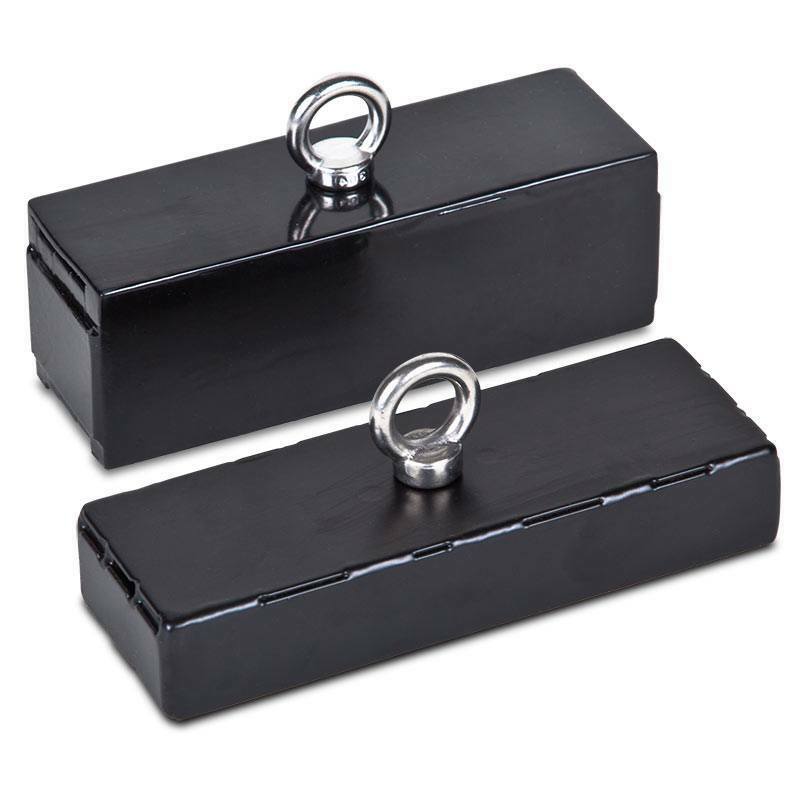 They contain good quality of ceramic (ferrite) magnets and is capable of lifting up to 25LBS – 300LBS. Under normal use, permanent magnetism guaranteed. Heavy Duty Underwater Retrieving Magnets – Easily retrieve lost fishing gear from lakes or rivers. Separate scrap iron from waste or clear your garage of nails, screws and sharp metal after your next project! Whatever the application, you can attach your own choice of line or the retrieving magnet can be easily mounted to your wall or workbench to help hold metal objects. Super Holding and Retrieving Magnets are special design with Heavy-duty retrieving function. They are made of plastic and magnets. With this design, they have good appearance and prevent potential injuring during working time. 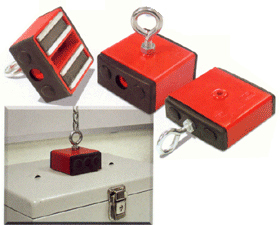 Please add the enclosed eyebolt on the top or side of the Holding Magnet and use to hold, lift and hang objects. Hundreds of uses are possible. NOTE: They are not fit for working in the water or heating environment.